WIDE CANE is used on rocker seats and backs primarily but also used on small dog ear, mule ear, ladder back style chairs. 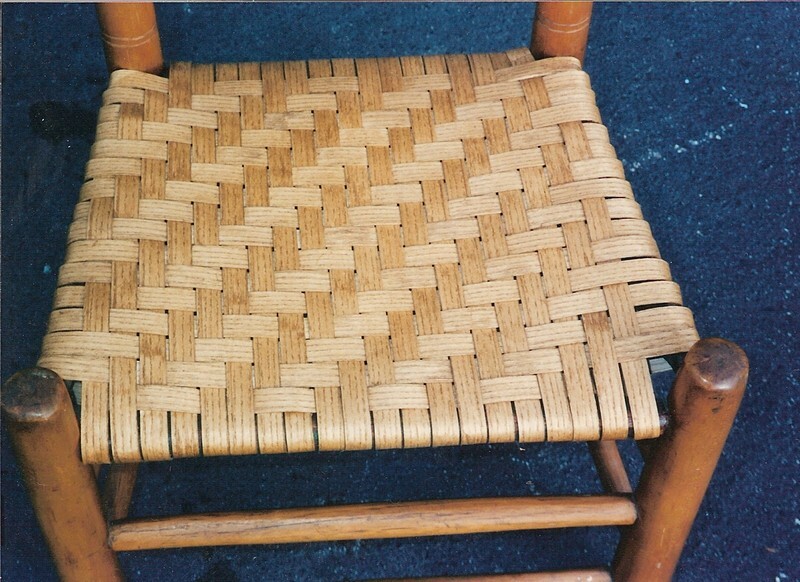 Two patterns are available, the basic basket weave and herringbone/tweed pattern (as shown in this photo.. Pricing is based upon size of seat and/or back, measure left to right at widest point, front to back at widest point. Requires no staining or no finish. WE OFFER A NUMBER OF DIFFERENT KINDS OF CHAIR CANING: Hand-cane, prewoven press-cane, rush, wide cane, splint, shaker tape, danish cord. Listed below are descriptions and pictures to help you determine which type you need. 20% deposit required on most caning services. For pricing you need to determine the type caning you need, gather the measusrements, and call or email us. Cane is water repellent, therefore stain resistant. However, there is a stain product made for some chair caning. Cost approximately 10% more, will darken it slightly, can eventually wear off. Another option is to tape off the cane area and spray the cane with colored lacquer to desired shade. 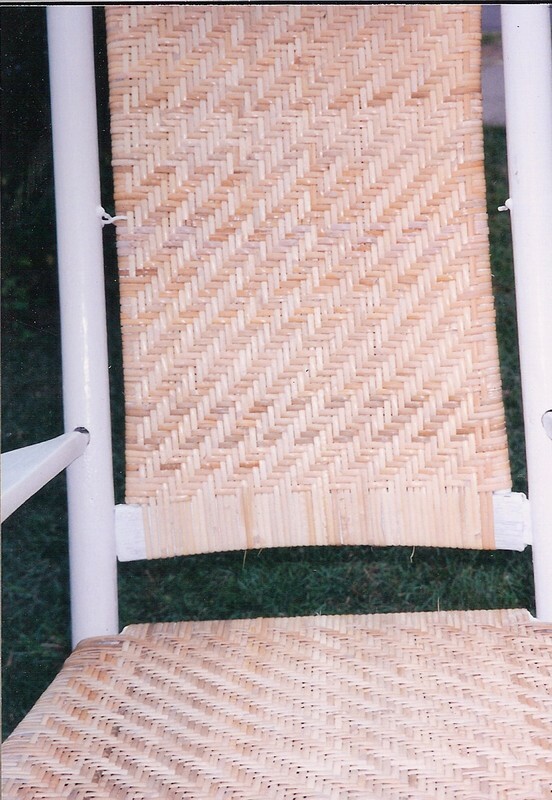 Cost approximately 25-35% more, will not guarantee color matching to old cane, chair color, or other caned chairs. Will eventually wear off, shorten the life span of the cane. Will get brittle faster. SHAKER TAPE is cotton webbing woven in the classic tradition of the Shakers. A basket weave pattern. 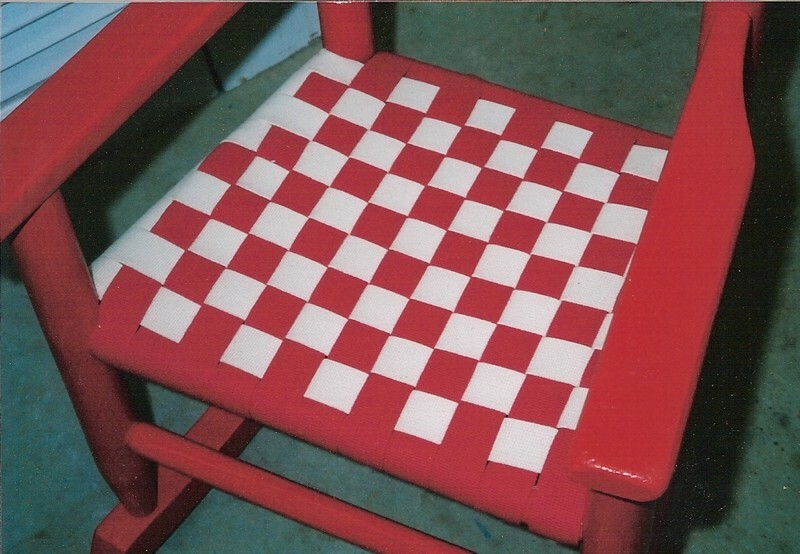 Choose one color or combine colors for a checkerboard pattern. Foam pad is included. This is expensive but beautiful. Does tend to sag, fade with time. 35% deposit required. LEATHER SEAT REPLACEMENTS come in genuine leather or fiber leather, which is compressed cardboard/paper. Both are stainable. Pricing includes staining, nail heads, removing old seat. Need to know hole opening, size and shape, size of available nail hole area, side to side, front to rear. PREWOVEN machine cane or press-cane is prewoven by machine, and bought by the foot in varying widths. Seat will have a groove cut into the perimeter of the wood where the cane is “pressed” into the groove, glued, and an appropriate sized reed spline is hammered into groove. For pricing measure left to right at widest point and front to back or top to botom at widest point. Pricing does not include staining. HAND-CANE seats have holes drilled into the wood around the perimeter of the seat. Price is based on the number of holes drilled into the wood on inner edge of the seat, whether recessed or not, and shape of seat (round, square, horsehoe, balloon, etc. Pricing does not include staining. When you call for quote on handcane please count the number of holes drilled, the shape of seat, and whether holes are recessed on the underside or back. RUSH is a term used to describe a twisted plant (Bulrush) that was used to cover seats. Bulrush is hard to acquire, hard to do, and very very expensive. I don't do it. I can, buy pretwisted Bulrush and pretwisted Indonesian rush (which really isn't a rush, but a grass of some sort) and is a cheaper product but both will breakdown with time like any plant form. Twisted Bulrush should be used for very old antique replacement seats. 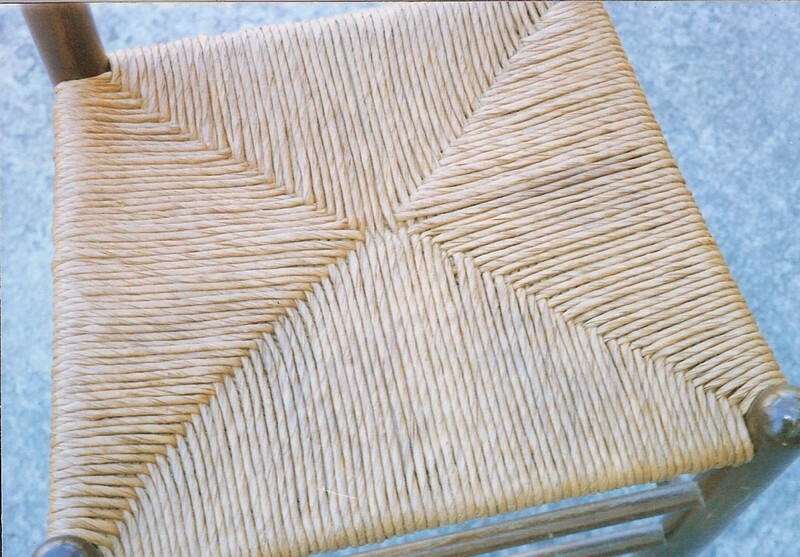 Fiber Rush is typically used on all chairs since early 1900's except for modern chairs made overseas which usually have Indonesian rush seats. Fiber rush costs less and will last longer than either of the other rushes under the same type use conditions. Danish Cord is similar to Rush but is a pretwisted fiber rope-type product used on Danish-style furniture seats. Two types of twists, laced and unlaced, one is a more uniform twist, more refined look. Somewhat expensive. Need to know size of seat, bent nails under seat frame or not. Pricing is based on size of seat, measure from front to back and side to side at widest point. Pricing does include finishing seat with coat of shellac. Staining seat prior to shellac add 10%. SPLINT comes in paper, reed, ash/oak, and hickory. Paper being the cheapest, hickory being the most expensive, reed being the most popular, ash next most popular. Paper, reed, and ash are for inside use. 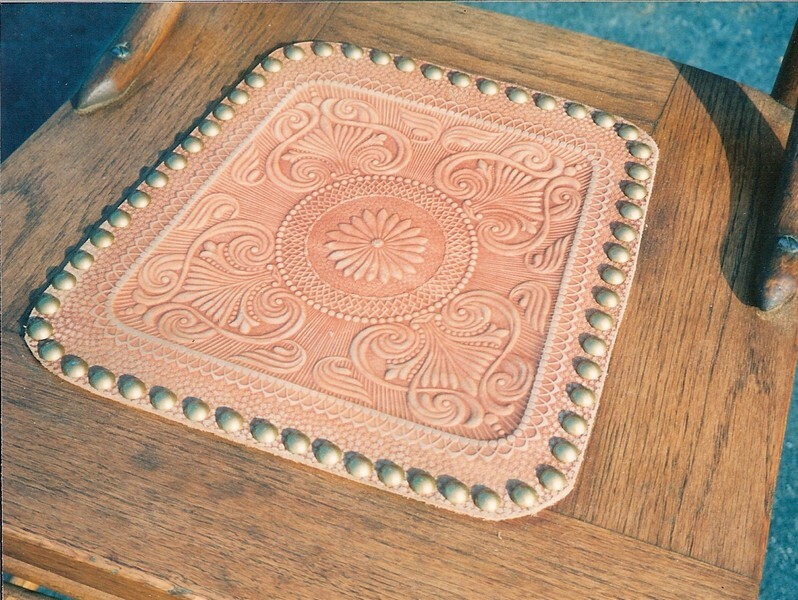 Hickory is used mainly for outside, rustic, or very old antique replacement seat. Pricing depends upon size of seat, front to back at widest point, left to right at widest point. Any seat with 4 rails can be redone using any type splint, rush or wide cane. Can do basket weave or herring-bone weave. Price does include staining seat. But no finish applied.